Hello. 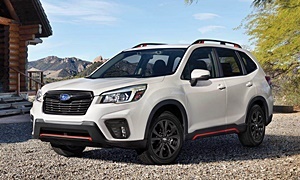 Was wondering if anyone who had a Subaru Forester in FL (South Florida in particular) could comment on the usefulness(or not) of the AWD and the a/c system as far as cooling the vehicle during the summertime. I like the vehicle, overall, but it just seems that reviews in mostly flat, hot, and non-snowy areas are not that easy to find. Any reliability issues/comments would also be appreciated. Thank You. I live in Dallas, which is "mostly flat, hot, and non-snowy," at least most of the time. Usefulness of the AWD--more a "nice to have" than a necessity. The roads here tend to fill up pretty quickly with water when it rains a lot, and drainage is poor, so in those circumstances I've found AWD pretty helpful. Also, Dallas has some REALLY badly-maintained surface streets, so there are some places between home and work where I'm basically doing light off-roading some of the time, or where the streets are really slick, so AWD helps there. AWD also makes it easier and more fun to take corners fast ;) Is it vital? No. Could I live without it? Sure. But I like having that extra degree of safety/stability, and it's also great when we drive up to New Mexico or Colorado in the winter. The a/c is decent, but not phenomenal. It struggles to keep up when the temperature gets in the high 90s, or when there's just a lot of direct sunlight, because those windows are so huge. If it gets too hot out, I have to put the a/c on full blast if I have the kiddo in the rear, and even then he sometime ends up sweating. (I have the premium trim, so no a/c in the rear; the higher-level trims might have vents in the back that would solve that problem.) But that's really only when the temperature really gets up there; the majority of the time it works just fine. I've had it 3+ years now and it always starts up and cools down quickly, and I've had no issues with it (knock on wood). I drive a 2015 Forester and appreciate the safety of the AWD; when I shopped for this car AWD was near the top of the list of must-haves (if you've hydroplaned on a freeway in heavy rain, it sure makes a lasting impression). I've driven this car in light snow, heavy rain, on dirt roads and across tilled farmland between rows of cornstubble with decent traction and torque. In an emergency that AWD could also be a happy game changer. I can't address the a/c other than to say I appreciate having it when I drive into the heat of the Sacramento Valley in summer and it works very well. The car I drove for 25 years before that had faulty a/c that gave out after a few years andI never got it fixed (I live in foggy-summer San Francisco Bay Area, so it wasn't really essential; open windows and tangled hair was the hot-weather norm). I live in DFW Metroplex in TX and drive a 2001 Subaru Forester S. AC as others have stated is barely adequate for temperatures above 90ish. The AWD is useful during the odd ice storms here in DFW. It is very useful during the rainy season as it helps with starting from stop, corning. Is it essential in DFW? No. However having driven both FWD and AWD, I very much prefer Subaru's AWD over FWD: no torque steering, less under steer while corning, even tire wear vs FWD wearing out front tires only. No tire spin on startup when raining. Like those responses from Texas, when it rains here, it can RAIN, and the roads can flood, flood, flood. So having the AWD is handy and helpful. And if I do want to drive up to the nearby mountains and ski areas, I can easy and quick. But AWD is also good on the dry, as well. It changes the way that the vehicle handles. For example, if you look at most FWD vehicles, they can have a tendancy to pull right or left when you accelerate briskly from a stop. RWD vehicles can tend to slide a bit at the back when applying the gas as you pull out of a corner. The AWD keeps power to all wheels and keeps it where needed, no matter what the condition. As also has been mentioned, the AC is good but not stellar. In my area, summer time temps can easily clear triple digits and go into the one-teens... Usually, putting the AC on full blast, recirculating the air, I can get the interior cooled down in about 5 to 10 minutes. I've got a 2.5 Limited with the silver/gray leather interior. When I got my Forester, I also looked at a 2014 XT Turbo Touring, but they only come with a black leather interior... The deal I could have gotten on that one ...! But during the test drive, it took about 20 minutes to cool down the interior to where we were not sweating... Airflow to the back seat can be a bit .. meager. Again, especially on really hot days. I've yet to find the imported vehicle made after the turn of the century that have AC units that can easily handle the heat of the desert. My parents live in Florida (Naples) and they recently purchaesed their thrid and four Subaru. The first two were Forresters that lasted ten years. One with 130,000 miles, the other with 110,000. They just got tired of the cars as they still ran. The AC was taxed but it did keep up with the Florida summer heat and hummidity up to about 100 degrees (it rarely gets hotter than that). It has to run at full blast and is a little noisy, but it kept the big stationwagon (small SUV) pretty cool. Now they own two Outbacks as they wanted to downside a bit (2015 model year). The AC is quieter now but not more powerful, so it works hard at those summer temperatures but keeps the car cool. I visit them during the summer ever other year and last year in the mid 90s I was not sweating but the car worked hard.